The return of the Bald Eagle is a satisfying success story. With�the banning of DDT, protection from idiot shooters, and the transplantation of chicks, the big fish-eaters will be around the US for our kids to see. This bird can be found, in small numbers, almost everywhere in the US where there are large bodies of water,�except in mountains. 10,000 nesting pairs in the lower 48 isn't much, but it's lots more than the 400 in the 1960s. 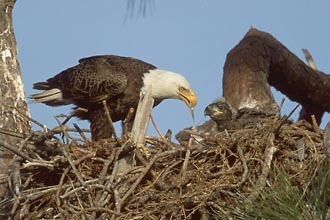 Read about the Bald Eagle here. uh, just my uneducated observation, but did anyone notice the irony of this coming out on the day the shamnesty was crushed? Freedom flies free again perhaps.